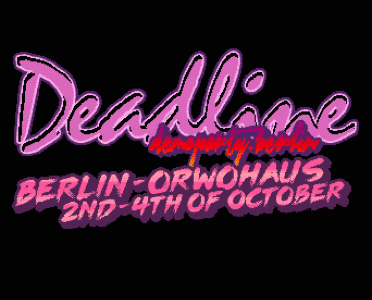 Here is a demo-invitation for the Deadline Demoparty 2015 in Berlin, for the Amiga. This prod is fully written in C, in the great mandarine tradition, so you might experience a couple of slowdown, especially on an A500. Runs quite ok on a stock 1200. Thanks for TRBL for giving an opportunity to code my first demo invite! Cool, great music and gfx. However, if you try it on A500, the music limps and stutter a bit at some moments. Which is a pity considering the 1980s mood. The ending scroll text is a bit short and could be a bit more informative. Nice to know that there will be a chiptune festival inside the party but what about compos? Thumbs up anyway cause it's a nice invtro. Nice tune, cute pixel rendition of Oberbaumbrücke :) .. Can't thumb this up due to the serious slowdown issues though, I hope there will be a final. Thank you fra for your dedication and patience to deliver an amiga invitation for our party! ham, right that information comes a bit short in the demo - you can read all about deadlines compos here. We also accept remote entries by the way. Love it ! Stylish and retro. Nice tune, some nice design, but otherwise very simple. It's ok.
i really didn't like the music. stuttery here; will await a final. I'm the one to blame for the slowdowns, more than the C language, I think. page created in 0.014278 seconds with 16 queries.